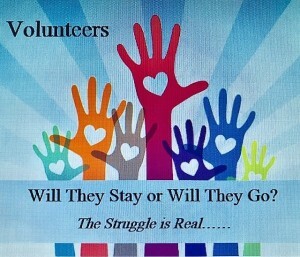 Clearly we can all relate to the revolving door of volunteers. They come and they go and we are losing valuable resources. Have you ever asked yourself why? Of course you have…..but the answer may not be one you want to hear. Today, more than ever, there are large numbers of retirees and young individuals that are looking for volunteer opportunities. So with so many volunteers out there, why are we struggling with attracting and keeping our volunteers? Here’s a hint: the problem lies within us, not the volunteers. Ok, so let’s first take a look at why people volunteer in the first place. They are seeking a sense of well-being by connecting with others for a cause they feel strongly about. Maybe they are looking to make new friends. Perhaps they want to share their talents and experience or learn new skills. Or, it could be as simple as wanting to help others. Whatever the reason, they are ready, willing and looking for opportunities. Now let’s jump to why volunteers to leave. They might feel undervalued and left out of the organization. Maybe they never received any training or direction. Perhaps no one took the time to match their skill set with the needs of the organization. How can we change this cycle of coming and going when nonprofits rely heavily on volunteers? How do we stop losing billions of dollars in lost labor? The issue is with us and we need to make changes in how we recruit, train, lead and nurture our volunteer community. In addition, we need to involve our paid staff members in the entire volunteer process from recruitment to nurturing. 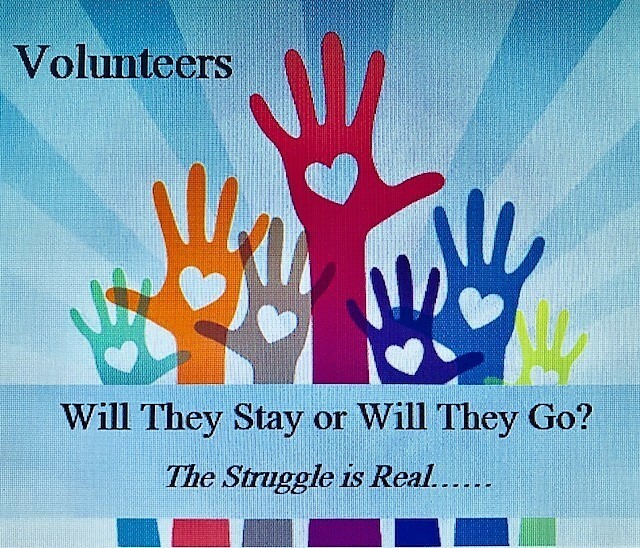 Including paid staff in the process will reassure them that volunteers are not there to replace them, rather to help them and the organization as a whole. Allowing staff to train and lead volunteers will only solidify their relationship and provide each with an understanding and respect for one another’s work. As leaders, we need to take the time and work with our volunteers, finding out what their skill sets are, what they are interested in and how they can best help the organization. Volunteer work is a job and like any other job, it deserves a description clearly outlining the goals and expectations. Last, but certainly not least…..RECOGNIZE & REWARD your volunteers. Tell the world how AWESOME they are! Spread it all over social media and on your website and watch how it encourages others to volunteer as well. Remember, volunteers are there because they want to be. They want to help make a difference in this world. Thank them…….personally and publicy. Small gestures can go a long way. Take the time to work with your volunteers, show them how much you appreciate what they do and they will keep coming back.